A perfect, healthy, summer dessert. Bring these to your next BBQ it really can’t get easier than this! Your kids can even help make them, the presentation is adorable!! 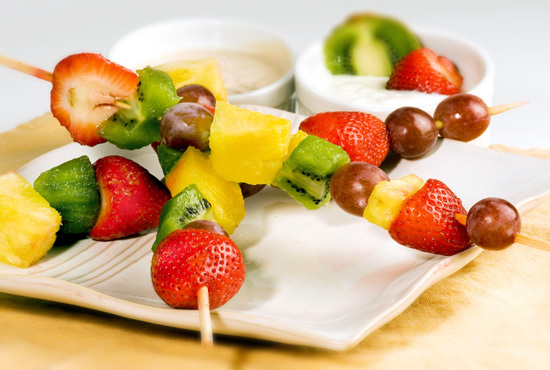 Use your favorite summer fruit and either serve them as-is, with a fruit dip or with melted chocolate – fondue style. Points will vary depending on the amount of fruit you place on each stick or what kind of fruit you use, but each kabob is usually about one point. A simple dip I like to make for fruit is mixing low fat sour cream with brown sugar like I did for my Skinny strawberries romanoff. 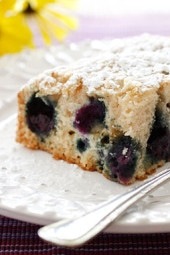 Also great with fat free Greek Yogurt. Cut fruit into bite size pieces to keep them all relatively the same size. 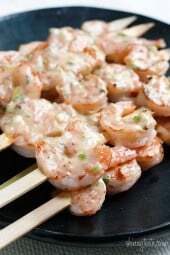 Place onto wooden skewers and keep chilled until ready to eat. Combine sour cream and brown sugar. Place in a bowl to use as a dip. It's confusing, but using fruit in a recipe is no longer 0. Since this is served with dip, I think it should still be 0 pts plus. What do you mean by depends on fruit? I thought all fruit was free on Points Plus? Please help me with my confusion. Hi Gina! I've used this idea and recipe for a few parties lately and it's been a huge hit. For a really fun display, get a pineapple and have them sticking out of it like crazy hair. It makes a great luau centerpiece and snack! Those look so pretty Gina! I especially like the dipping sauce! YUM! I'm making Fruit Kabobs next week! These won't last long! It fresh, live food and it's fun and tasty! Thanks for the idea! Thanks Jessica!! I'd rather use real food whenever possible. Sugar isn't as high in points as fat so I just like to use less sugar, honey or agave when a recipe calls for it. I LOVE YOUR BLOG!!!! 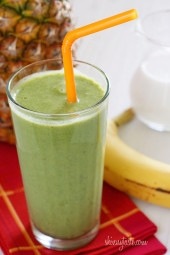 I love cooking healthy and I've done weight watchers in the past and should start up again. I always try to cook healthy meals for me and my family. I also LOVE that you don't use splenda! It's hard to find low fat or low point recipes that don't use splenda but you do and your meals turn out very tasteful. You've done an incredible job and I just love referring back to your blog for recipes. I make about 1-2 of your meals a week! The photographs are amazing as well. I am a photographer (just as a hobby) but I can see how amazing you are at taking photos and cooking two of my favorite hobbies! THANK YOU!! Keep those amazing dishes coming!! I don't know about better, but it would be lower in points! Yum! I’m a big fan of a fruit dip that’s very fatty and not WW friendly. I’m going to give this one a try! I substituted plain greek yogurt for the sour cream, even healthier and just as tasty!